In their hanging installation A.N.N. Péter Koros and Réka Magyar (Koros Design) use light to show a process that we use every day without realising it. A.N.N. stands for 'artificial neural network'; this is software that mimics systems in our brain. It receives signals, interprets them from previously acquired knowledge and then processes and sends them. SIRI is an example of an A.N.N. A.N.Ns are used for speech recognition, self-driving cars and personalised filters on social media. You could say they are incredibly influential media in our current society. We asked Péter and Réka about the most special element of their work of art: "The most special elements are the technique and the material. 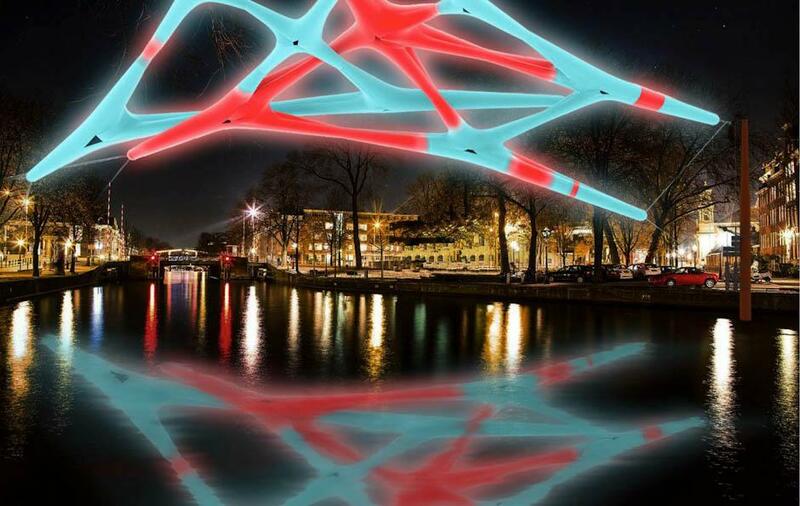 We used light weight textile for A.N.N, the inflatable installation is hanging above the canal. It is a large scale floating structure. A fun fact: when we created the artwork, we used enough thread to circle the earth twice!" "We used enough thread in this artwork to circle the earth twice!" Using textile as main material for this installation is no coincidence: Koros Design has been designing kites for years. Péter and Réka put their experience to good use in making inflatable light artworks.